Gallons of industrial paint, coating and solvent can really take up space. How do you get rid of this stuff without getting fined? 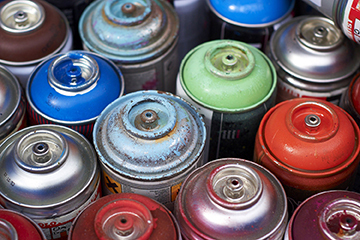 Educate yourself and properly dispose of your business’s paint cans, excess paint and solvents. The environment and your budget will thank you. According to the U.S. Environmental Protection Agency, waste generators must determine if their waste is hazardous or nonhazardous and manage it accordingly. Paint-contaminated wastes, including masking, overspray/floor sweepings, rags, and paint booth exhaust filters, may be hazardous because paint contains solvents and possibly toxic heavy metals. These chemicals can harm the soil, water and Iowa wildlife. You can prevent pollution by brushing up on these disposal guidelines. A paint or solvent container, whether paint can or aerosol can, falls into one of two categories, empty and unused coating materials. Both categories include eco-friendly disposal recommendations and can be taken care of in no time! An empty or non-usable container contains less that 3% of its weight by its original matter, so in this case paint or solvents. These containers are considered “empty” and exempt from U.S. EPA hazardous waste regulations. An eco-friendly disposal recommendation for “empty” containers is asking if the supplier or store accepts empty containers. You can also recycle empty containers at a local scrap metal or plastics recycler. In a final effort, you can dispose of “empty” containers in the landfill. Usable paints, solvents, and related material unfit for resale are not considered hazardous wastes if the material can still be used for its intended purpose. For example, paint mixed incorrectly or products past their expiration date can be repurposed. You can contact your Iowa Regional Collection Center to find paint repurposing resources near you. Many paint products and solvents have “best by” or “sell by” dates. Although these products are unfit for resale and no longer meet quality standards, they can still be useful. Instead of disposing of them, donate them! Many non-profit organizations such a community centers, churches and service groups can take painting products off your hands. It is a win-win, your business is able to reduce its inventory and a local organization gets a fresh coat of paint! Paint should never be poured down the drain or dumped in the garbage. To protect our planet, all hazardous waste must be recycled on-site or be disposed of off-site by an EPA-permitted hazardous waste management company. If the facility is a Conditionally Exempt Small Quantity Generators (CESQG) (or as of July 2017, a Very Small Quantity Generator (VSQG), the hazardous waste may be disposed of at a state household hazardous waste regional collection center or Toxic Clean-up Day. A list of other storage and handling requirements can be found online at the EPA website or at your Regional Collection Center. Whether your business has one gallon of paint or 50 gallons of paint, disposing of hazardous material properly is an important part of reducing our environmental impact and avoiding potentially hefty fines.